(Phys.org)—A small team of researchers with the Directorate for Sustainable Resources in Italy and Ghent University in Belgium has found evidence that shows some parts of the planet are becoming cooler and others warmer due to an increase in localized greening. As the team notes in their paper published in the journal Science, much of the increase in greening is due to an increase of atmospheric carbon dioxide. In addition to causing the atmosphere to heat up in general, the increase in atmospheric carbon dioxide is also causing many parts of the planet that were already green to become greener, the researchers report. That greening, they suggest, causes some regional areas to become slightly warmer and others cooler. But it is not just atmospheric carbon that is contributing to the greening. Nitrogen used in fertilizers makes its way into natural ecosystems, causing changes. The land is also changed by human activities. 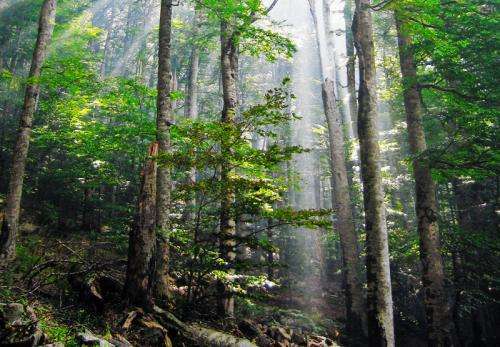 In an area that is generally warm, an increase in leaf cover can lead to localized cooling due to plant transpiration (water evaporating) which condenses in the air, the researchers report. In cooler places, the impact can be the opposite—in boreal regions (tree covered) and colder places, local temperatures can rise slightly due to less sunlight being reflected back from the surface. To come to these conclusions, the researchers studied satellite data for the period 1982 to 2011, which allowed them to assign a leaf area index (LAI) to various parts of the Earth's surface. In mapping the entire planet, the group found that for approximately 60 percent of all plant areas, an increase in greening has mitigated global warming by approximately 14 percent. For colder areas, greening has led to a rise in air temperatures of approximately 10 percent. They also found that the impact could be more dramatic during extreme weather conditions—by up to five times, for example, during warm and dry periods or cold and wet periods. The researchers suggest their findings indicate that changes to vegetation clearly have an impact on local climate, and thus should be taken into consideration as mitigation and adaptation strategies are developed to deal with a warming planet. Changes in vegetation cover associated to the observed greening may affect several biophysical processes, whose net effects on climate are unclear. Here, we analyze remotely sensed dynamics in leaf area index (LAI) and energy fluxes to explore the associated variation in local climate. We show that the increasing trend in LAI contributed to the warming of boreal zones through a reduction of surface albedo, and to an evaporation-driven cooling in arid regions. The interplay between LAI and surface biophysics is amplified up to five times under extreme warm-dry and cold-wet years. Altogether, these signals reveal that the recent dynamics in global vegetation have had relevant biophysical impacts on the local climates and should be considered in the design of local mitigation and adaptation plans. "In mapping the entire planet, the group found that for approximately 60 percent of all plant areas, an increase in greening has mitigated global warming by approximately 14 percent. " Thus, Co2 is warming the cool areas and cooling the warm areas. Food crops are doing better also. Oh will the devastation wrought by Co2 never end. What will climate change chicken Littles do now? Do they want a greener planet and more CO2, or not? Maybe they'll go bury their heads in the sand and suffocate in a Darwinian example of weeding out some stupidity from the human race, or perhaps they'll shut up and quit demanding that the government take peoples' money for climate change research.
" weeding out some stupidity from the human race, "
It is not just the "stupid"! Some very bright but untrustworthy and self-serving people are involved in this hoax. One of the major problems I have with the climate science is the lack of good news from a minor temperature rise or increases in CO2. If rising temps were really that bad, people would look at every summer season with true horror. Why is there such a dedicated squadron of denialists on phys.org? It's not just global warming, it's also the electric universe maniacs and even a few flat earthers. If one despises scientific consensus so much, why go to science websites? Is it purely to inflict one's ignorance upon others? "If one despises scientific consensus so much, why go to science websites?" News flash, consensus has nothing to do with science. Tell that to the climate scientists! There is no reason to claim we are in the danger zone .... when CO2 has reached 2300 ppm in the past and we are at 400 ppm today. Since earths population is only increasing, we will need the increased plant growth + food production that the elevated CO2 levels will afford us. I, for one, refuse to eat insects and algae ... isn't that whats on the ultra liberal dinner plate these days? It's pretty well known that elevated CO2 levels will result in less food. The increase in droughts and floods make it difficult to grow. The increase in heat make it difficult to grow. And for many of the staple crops (e.g., wheat and rice), the increased levels of CO2 lead to less nutritious crops. Why would someone's politics have anything to do with this? Are you claiming that only "ultra liberals" accept reality? I don't actually know any "ultra liberals", but the people I do know, liberal or conservative, all accept reality. And most prefer meat - though dad (who was a conservative) did turn somewhat vegetarian later in life. One of the major problems I have with the climate science is the lack of good news from a minor temperature rise or increases in CO2. Maybe that's because there isn't really a lot of good news about this. Think about it - contrarian scientists are extremely well funded. Why don't they publish good news? I think the problem some laymen have is that they don't quite understand science. Science isn't like business where you can see good news by the end of the quarter and don't worry about the next quarter. Since it's well understood why we're warming and that the warming won't stop, an honest scientist has to point out that in the medium to long term, AGW is a bad thing. And the competition in science means that if you're going to be successful in science, you have to be honest. If rising temps were really that bad, people would look at every summer season with true horror. The frog and boiling water story come to mind. "The frog and boiling water story come to mind." Funny, The boy who cried wolf comes to my mind. By the way, ZZ, the frog and boiling water story has turned out to be a hoax. Maybe some of your other ideas belong in the same category. Jeez I don't know, when I was a kid we put a frog in hot water and it immediately went belly-up. True story. Apparently they have a very low tolerance. Re global warming, there are much more important reasons for the AGW myth. Distributed energy production is protection from natural disaster and terrorist attack. The tech developed in response to it is also directly applicable to off-world colonization, and would not have been developed otherwise. When you understand the importance of distributed human existence as protection from natural disaster and terrorist attack, you begin to appreciate what extreme measures may be undertaken to make it happen. AGW, star wars, even the phony cold war which gave us 8000 tons of fissiles and rocketry. We now have a reliable way of getting off the planet and reliable power sources for construction and living. By the way, ZZ, the frog and boiling water story has turned out to be a hoax. I think it's pretty well known it's false, that's why it's a story and not a fact. The point was that Ironwood's claim that people would be horrified of a ~0.019C/year increase in temperature (the current trend) was extremely foolish. I doubt anyone would notice. People are noticing the long term warming, however. Maybe some of your other ideas belong in the same category. Nothing I said was very controversial. Laymen, such as yourself and Ironwood, don't really understand science. Witness, for example, demands for proof. A scientist could claim that the warming will stop after a half degree increase. The politically minded would lap that up, but the scientist would be laughed at by other scientists unless he had extremely good evidence. ZZ, you claim "Nothing I said was very controversial." "It's pretty well known that elevated CO2 levels will result in less food." -> This is controversial. Why do you make up stories? The CO2 levels have increased for a century. Has it resulted in less food?? "The increase in droughts and floods make it difficult to grow." -> This is controversial. We have not seen a general increase in droughts and floods up to day. Claiming this will be the case in future is highly debatable. Mankind continues to make excellent strides to in fact mitigate such happenings. "The increase in heat make it difficult to grow." -> This is controversial. Why are the hot equatorial areas some of the greenest places on earth? "And for many of the staple crops (e.g., wheat and rice), the increased levels of CO2 lead to less nutritious crops." -> This is controversial. These days we have some of the most nutritious crops ever, despite an increase in CO2. Please defend your statements. You do remember that the wolf did come in the end? And that the villagers were to dumb to heed the warning? Right? Right? Anti you are correct there. It was a poor retort. IMHO our most pressing concern here in the US is a financial Armageddon caused by out of control government spending and a population that has very high personal debt and no real assets. We all think that we are so special and intelligent that Zimbabwe can't happen here. This economic collapse will happen way before any possible climate change. The US has plenty of potential to cut down spending. Heck, if the US cut military spending by 50% (which would still put them WAY ahead of anyone else in the world) it could be debt free in 50 years without having to cut back on anything else. This economic collapse will happen way before any possible climate change. Having to spend on relocating cities will make it certain. Avoiding that expenditure will make it manageable. Anti military spending is a pittance in comparison to entitlements. Social Security, Medicare, Medicaid and federal, state and local pensions are all bankrupt. You could take all of the money from the US "Rich" and not even make a dent in the problem. It would make sense from an ecological standpoint to reduce the US and world population but with our debt based financial system this is not feasible without and ever increasing supply of contributes. That is why the West is so pro immigration, it needs an ever increasing supply of workers to tax and the locals are not reproducing enough to keep the Ponzi scheme going. Social Security, Medicare, Medicaid and federal, state and local pensions are all bankrupt. If the US were less obsessed with the role it only thinks it plays in the world (and after the latest summit that illusion should be a burst bubble for about everyone) and it di reallocate its useless military budget it could be a pretty neat place to live in. This is interesting. It should give us some idea of how a creationist thinks. I perhaps should have said it wasn't controversial in science. Those who believe that politics can dictate reality may find it controversial. The CO2 levels have increased for a century. Has it resulted in less food?? So nothing was made up. As we saw from the last comment, BartA didn't even bother to check before making his comment. That seems to be a common thread in his/her comments. We have not seen a general increase in droughts and floods up to day. Claiming this will be the case in future is highly debatable. Except, of course, that we have seen a general increase. In the US, we've seen an increase of heavy downpours (http://nca2014.gl...creasing ) which will lead to flooding. Droughts have also increased. Even climate contrarians like Pielke, Jr have noted in congressional testimony that drought in western and southwestern US has increased (https://skeptical...-jr.html ). Actually, he tried to mislead congress, but included the note of the increase in a footnote. And there is exactly zero controversy about these trends continuing as the environment warms. So we see, again, that a creationist didn't bother to read anything before making his claims. Again, BartA refuses to do any critical thinking. Why would heat make it difficult to grow? Why would the tropics be different? For the 2nd question, you might want to look up Hadley Cells. Most of the world's arid regions are on the poleward edge of the Hadley Cell. And they should grow poleward as the world heats. So more desert. As for why heat makes it difficult to grow, at temperatures above 68F, photosynthesis starts to slow down (http://sciencing....595.html ). And above 104F, it goes quickly to 0. Hmmm, could BartA be wrong about all his/her thoughts? These days we have some of the most nutritious crops ever, despite an increase in CO2. Please defend your statements. Maybe you should have thought about defending any of your statements. Do you have any evidence for this "most nutritious crops ever" statement? My guess is you made that up as well. But here's actual data showing that with elevated CO2 levels, many crops like wheat and rice are less nutritious (https://www.thegu...utrition or https://www.natur...179.html ). This evidence was easy enough to find. Why didn't BartA bother to check? Is this complete lack of intellectual curiosity a common trend with creationists? I find BartA's comment pretty illuminating. I think it's worth pointing out that neither social security nor medicare are going bankrupt (I don't know about the rest). Both have fixes, but the fixes require politicians with intelligence, honesty, and the will to do difficult things. These characteristics are in extremely short supply in US politicians. I read one of your links about crops and found the iron in rice would is projected to go down by 5% but it failed to mention that more rice could be produced by higher CO2 levels, rice would require less water and more crops could be harvested per year.. Half truths are the meat and potatoes of the AGW crowd. "(CNNMoney) If lawmakers don't act, Social Security's trust fund will be tapped out in about 18 years... To make all of Social Security solvent for the next 75 years would require the equivalent of any of the following: immediately raising the Social Security payroll tax rate to 14.98% from 12.4% on the first $118,500 of wages; cutting benefits by 16%; or some combination of the two. "Medicare faces insolvency two years earlier than expected..."
- So raising taxes and/or cutting benefits are the fixes that intelligent, honest politicians would do? I believe Greece is also short on intelligent, honest politicians. Otto state and local municipal employee pension plans are also vastly underfunded. The only real solution for many cities and states will be huge concessions or bankruptcy. Real wages have been decreasing since the 70s. The biggest inflation rapes have been perpetrated by the medical and educational systems. The US leads in per capita costs in both and is in the middle of the pack as far a results go. The only solution to poor student achievement that you ever hear is "Give the schools more money." despite the fact that we spend more per student than any other country. Again, I regret looking at an MR166 comment. Hospital costs are out of control. They have to treat everyone regardless of the ability to pay. Uncollected bills are paid for by the insured and the self insured. If you pay cash it is not uncommon to be charged 10x the amount that an insurance company would pay. If a government forces a hospital to provide service to a patient then that government should be forced to pay the bill if it goes uncollected! Intelligent, honest politicians need to consider paying machines directly and taxing them immediately for the work they do, like billionaire CEOs are suggesting. This will recover lost revenues which are currently flowing into billionaire CEO pockets. The other alternative is a vast expansion of the GDP by creating funds for vast new industries such as space colonization which billionaire CEOs are currently undertaking. Aa wants to cut milspending which of course will idle millions of workers and further reduce revenues, leaving less booty for invading Saracens. Maybe they'll decide it's not worth the bother. Good idea aa. Hey why don't euros help out by paying their NATO bills? It would be much appreciated thanks. First of all 1 degree C is a huge increase, almost 100 years worth. Also if temperatures become a problem different varieties will be developed to cope with the problem. Lastly we were talking about CO2 levels not temps. you know... rate of change? Actually, paying machines directly for the work that humans used to do would enable entitlement compensation to be removed, in addition to taxes, without ever being touched by 'owners'. Where is this money going at present? The owner pockets all the profits his spiffy new machines generate. And he no longer has to pay ss, 401k, pension, healthcare, vacation, etc. Even if we succeed in increasing owner taxes, we would lose his cut. ALL that money can be recovered directly and immediately if and only if we pay machines as we now pay humans. This disparity has existed throughout the industrial revolution. It is the main cause of communism - more workers chasing fewer jobs. But because machines are just now capable of recording exactly what they do and what they consume, we at last have a real solution at hand.